ZaZaTool Swimming Pool Spa Fountain Leaf Debris Skimmer Net with 4' Telescopic Aluminum Pole | Fountain City Art Ctr. The pole adjusts from 21.5 - 48 inches long with a total extended length including net of 60 inches. This lightweight, easy-to-use, 4 foot telescopic pole with integrated leaf net is super handy for quick cleanup of pools and spas. Made from aluminum and rugged plastic, this space-saving cleaning tool is essential for smaller above ground pools or quick spot skimming any size pool. The included leaf skimmer easily detaches so you may attach it to an alternate 1-1/4" standard telescoping pole accessory. Note: the pole included with this net is designed only for this particular net only and will not fit other pool brush, net or pool tool accessories. The pole adjusts from 21.5 - 48 inches long with a total extended length including net of 60 inches. This lightweight, easy-to-use, 4 foot telescopic pole with integrated leaf net is super handy for quick cleanup of pools and spas. Made from aluminum and rugged plastic, this space-saving cleaning tool is essential for smaller above ground pools or quick spot skimming any size pool. The included leaf skimmer easily detaches so you may attach it to an alternate 1-1/4" standard telescoping pole accessory. 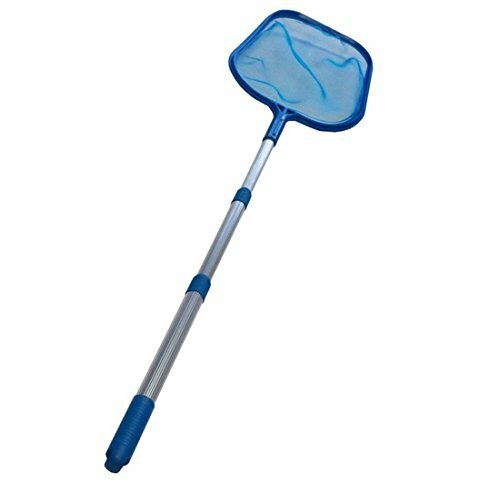 Note: the pole included with this net is designed only for this particular net only and will not fit other pool brush, net or pool tool accessories.